“Penny” is a 2 month old Shih Tzu cross that was having problems eating hard food. 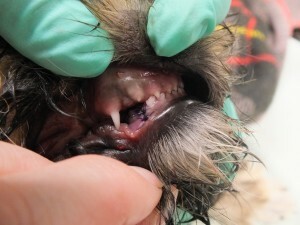 When she came in for her puppy shots, one of her bottom canine teeth was in the wrong position and was poking a hole in her palate! 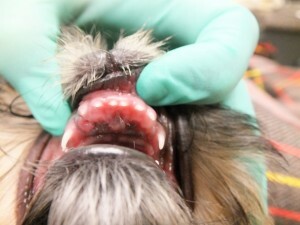 The baby tooth is not only very sharp and causing Penny a lot of discomfort, but it is essentially locking her bottom jaw into place. Jaws have growth plates just like any other bone. When the jaw is locked into position every time Penny closes her mouth, the growth plate is also locked into position, and the jaw is unable to grow to its proper length. We removed the offending tooth. 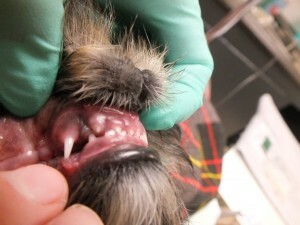 Penny was under general anesthesia for this procedure. 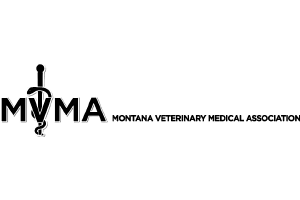 She received a long acting local block (similar to novocaine). She also received a combination of pain medication and anti-inflammatories to ensure that she recovered from the procedure comfortably!! 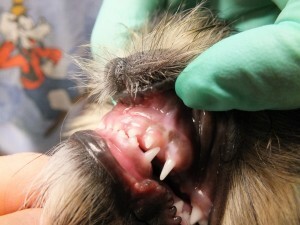 Hopefully, the jaw will now have time to grow and the adult canine tooth will erupt in the correct position!! Normal occlusion on her left side. 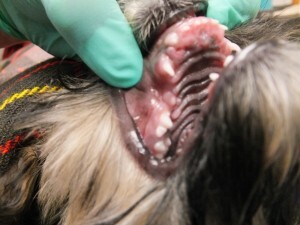 Note how the bottom canine tooth is in front of the top canine tooth. Abnormal occlusion on the right side. The bottom canine tooth is penetrating her palate. Note the hole in the palate! Ouch! 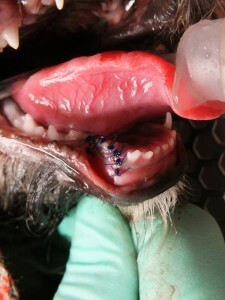 Here is the hole in palate from a different angle. 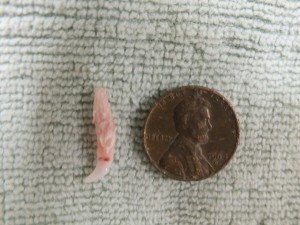 With the tooth gone, Penny can now close her mouth pain free. We hope that her jaw will now be free to grow and her adult canine tooth will erupt in the correct position! The sutures will dissolve in 21 days. We used a long acting local block similar to novicaine, as well as a combination of three different pain medications to ensure that Penny’s recovery is as comfortable as possible. Tooth after extraction. The root is very long and its important to extract the entire tooth without breaking any of it off. Its very fragile.